SAIL-SCL Kerala Limited (SAIL-SCL) is the only mini steel plant in Kerala. The company was originally promoted in the joint sector between the Kerala State Industrial Development Corporation Ltd. (KSIDC) and a private entrepreneur in 1969. 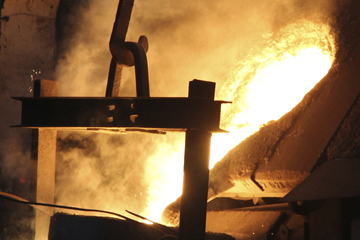 Company set up its mini steel plant in 1972 with installed capacity of 37,000 tons p.a. The Company commenced commercial production in September 1973. KSIDC raised its shareholding in the Company to more than 50% and thus Company became the subsidiary of KSIDC in 1979. In 1983 Company undertook expansion scheme by adding the third electric arc furnace, by which the production capacity was raised to 55,000 tons p.a. The operation of the company then improved and earned substantial profits during 1984-86. SAIL-SCL Kerala Limited "Steel Nagar"
© 2016 SAIL-SCL Kerala Limited.